Art and Culture Day at the Barrick, June 16, 2017. Photo courtesy Josh Hawkins/UNLV Creative Services. Top 5 things to do or go see in Las VegasMy focus will be on the public arts organizations (and one-non-profit) that work so hard, often hang on by a thread, always face the threat of budget cuts, yet give SO much to inspire the community. These spaces kept my creative spark alive when I was growing up and living in Las Vegas. Marjorie Barrick Museum (of course)! Also a great excuse to have a picnic in the cactus garden in front of the museum. Donna Beam Fine Art Gallery also a must-see if visiting the UNLV campus. Also if you are near UNLV, def see the Atomic Testing Museum http://nationalatomictestingmuseum.org/. A look inside the Atomic Testing Museum in Las Vegas, Nev. on August 14, 2017. Photo Mikayla Whitmore. Left of Center Gallery LOC is a sparkling gem in the desert, I am a huge fan of this gallery for many reasons. Not only did the founder/owner Vicki Richardson open this gallery in North Las Vegas, (an area of town not exactly known for arts resources), but she annexed the gallery with a museum of african art. So LOC is a museum and a gallery. 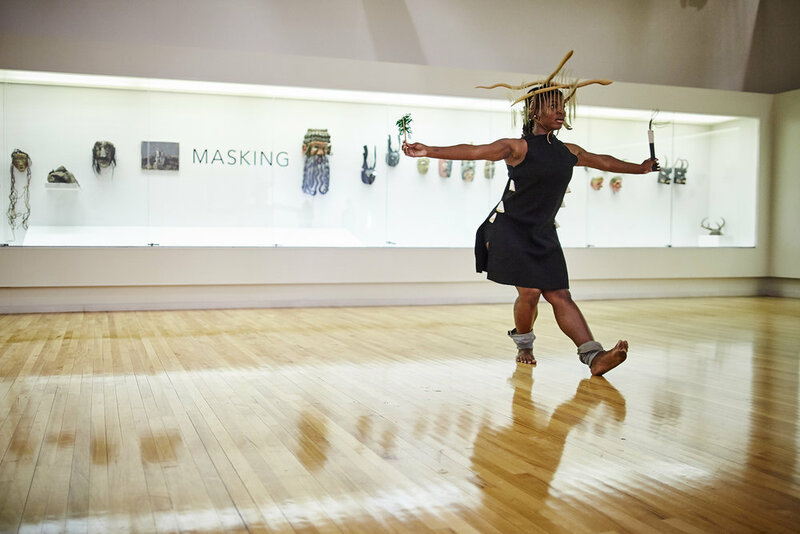 The museum has a permanent collection of ancient african art and the gallery has rotating exhibits of artists whose work is poetic and often political. The gallery shows artists from out-of-town so Las Vegas artists can really learn from seeing what others are doing. Also, it is the longest standing gallery in Las Vegas, 25 years I believe- impressive for a boom and bust town.While in North Las Vegas, I highly recommend College of Southern Nevada Fine Arts Gallery. There are many strengths to this gallery (Community College equal education opportunity affiliation, very cool space, great, meticulous curator; Jeff Fulmer.) More importantly, I love that this gallery is also in North Las Vegas. I would often make trips to LOC and CSN to look at art and it was so therapeutic and intellectually and visually stimulating, part of this is not just the art but the areas and demographics of the locations. Margaret Noble’s “Resonating Objects” at the CSN Fine Arts Gallery through January 20, 2018. Image courtesy Jeff Fulmer. Jeana Eve Klein, The End of Romance, at the Charleston Heights Arts Center through January 20, 2017. Image courtesy the artist. Clark County Public Art Works The Child Haven Mural by Sush Machida, ZAP boxes, "Centered" median sculptures (esp the one by Adolfo Gonzales). Best to pick up a public art map,( a very cool map designed by an artist) and follow the route. One of my favorite memories is following the public art map with my 7 yr. old niece, we treated it like a scavenger hunt, she loved it! Great way to see explore the Las Vegas. Chris Bauder’s 2017 public art installation, part of Clark County’s “Centered” project. Image Clark County Visual Arts. The Springs Preserve is a phenomenon, you get a full educational environmental education and tons of nature without leaving the city. 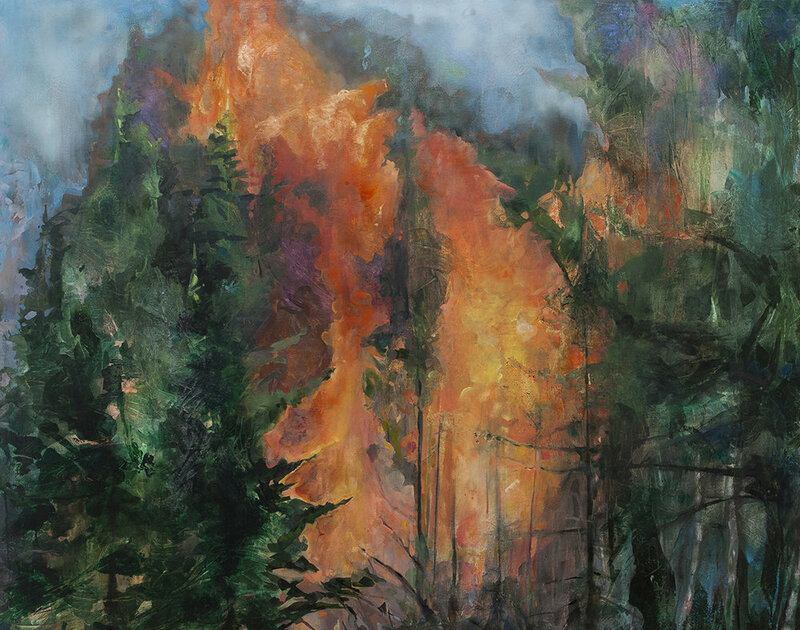 Elizabeth Blau, Embers, acrylic on canvas, 2016. Photo Mikayla Whitmore. Elizabeth Blau is a painter whose work has been exhibited in Las Vegas, Los Angeles, New York, Phoenix and Philadelphia. She has been awarded grants and fellowships from The Sam & Adele Golden Foundation for the Arts in New York, the Nevada Arts Council, the Helene Wurlitzer Foundation of New Mexico and The Arctic Circle Residency program. Each series of paintings by Elizabeth explores different ways our landscapes transform and how they are remembered. Elizabeth lives and works in Fremont, California and teaches Painting at Ohlone College. Artists’ Top Five is an ongoing series sharing short lists of artists’ favorite things to do or see in Las Vegas. In some cases, these lists become more nostalgic or idiosyncratic musings about a city we call or have called home.